Refill cartridge is designed for use with 3M Heat-Free Laminating System LS1001. 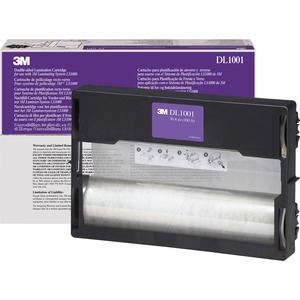 Cartridge film laminates both sides of an item for enhanced protection. Laminate items up to 12" wide and as long as 100'. The 5.6 mil refill features a glossy finish and can be used to protect many items. It is perfect for posters, signs and maps as well as documents, schedules, presentations, phone lists, certificates, awards, calendars, children's artwork and more. Laminating Sheet Width : 12"